It's pretty appropriate, how tropical it feels in San Diego tonight. A heat wave was broken by thunderstorms and a few minutes of pouring rain. Now it's 80F and 80% humidity long after sunset, and it's the perfect setting for the ten year anniversary of Hurricane Ivan. A bit of background about me is necessary at this point. For the first 23 years of my life, I lived in one town in California. My only foray out of the state was a five-month study abroad program in Australia, but that always felt like an extended vacation. As a result of all that stationary living, when the time came to accept my first post-undergraduate job, I moved from San Jose, California, to Pensacola, Florida. I got a job (an internship, really) at Gulf Islands National Seashore, working with sea turtles and shorebirds. It was a dream come true, for an ecology student. Most of all, I remember the chaos that was nesting season. Hatchling turtles naturally navigate by the light of the moon – what used to be the brightest light in the night sky. But in modern times, the lights of a major city and a military airport, and the little guys can get a bit disoriented and head in the wrong directions. It was my job to make sure that didn't happen. That meant I had to be there at sunset, to put the screens over the nests (to trap the baby turtles in case they hatched while I was elsewhere). Then I had to check all of the nests at 9 p.m., midnight, and 3 a.m. One last check at sunrise to remove the screens (don't want the babies to get stuck in the hot Florida sun), and then I would go drive the beach in a Mule to check for new nests, and spend the rest of the day until about noon checking on shorebird nests. It's the kind of job that basically only a young 20-something could do. I loved every minute of it. I loved the starry sky at night, the feel of baby turtles in my hands and the incredible amount of energy in their tiny bodies (they can really motor down the beach! ), and I loved my Fridays, when I would go grab dinner and sit in a zone of dazed exhaustion, anticipating the 14+ hours of sleep I had ahead of me. I loved my house that was on the barrier island, in the middle of the national park, even if tourists had a bad habit of considering us part of the experience and picnicking on our back porch. I don't think I believe in destiny. It seems incredibly arrogant, I guess, to assume that all the processes that make up our world could turn their focus to screwing up one person's life. So I likely just happened to be in the way when one of the strongest hurricanes in living memory aimed itself at the Florida panhandle. 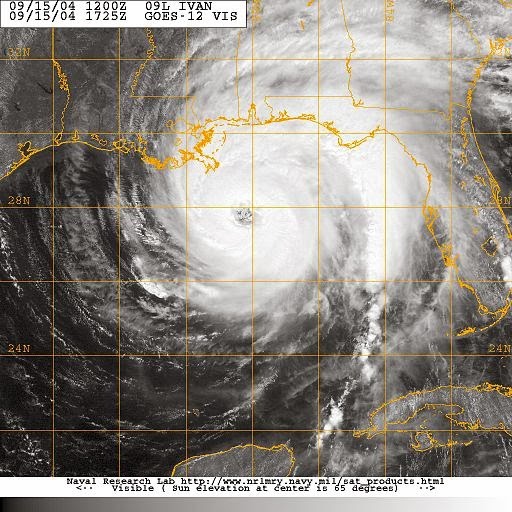 At its peak, Ivan was the size of Texas. It generated a 27 foot storm surge on the U.S. coast – and remember, that means 27 ft above normal ocean levels… not counting any waves the storm generated on top of that. Gulf Shores, AL. Picture by Jocelyn Augustino for FEMA, and thus in the public domain. At that time, I had the good fortune to be working for someone who had survived Hurricane Andrew in Miami. My boss organized the removal of all the Natural Resources equipment off the barrier island and to the mainland. He also took me, an intern with not much money, with him and his family to northern Georgia to wait out the storm. I still remember it quite clearly, sitting in a cabin in the Appalachian Mountains, watching the waves was over the top of a 50-foot high pier and thinking, Well, there goes my life. I would like to pause at this moment to emphasize how little I suffered from this storm. I didn't lose my internship, though I had a couple of scary moments. I did lose access to the house that I'd lived in, but it wasn't something I owned. I wasn't one of the many people who came back to town to find their entire home washed away, with only the concrete foundation remaining. I wasn't one of the people who had seven feet of water flood their house, rendering the first floor and the entire structure unlivable. 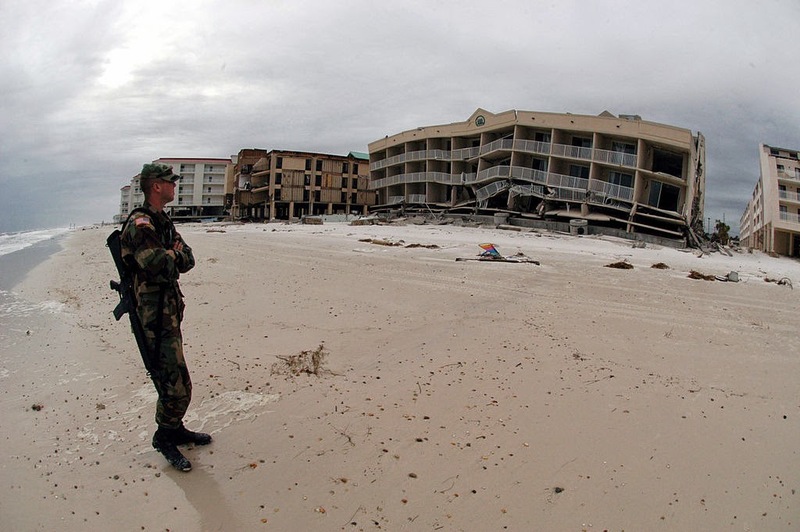 I wasn't one of the people whose family members decided to have a hurricane party out near the beach, who underestimated the power of a category 5 hurricane, and who died in the flooding (Worldwide, 121 people died due to Ivan). I was so, so lucky, and I know that, and I hope those people forgive me my grieving and remembering what I did lose, and my recounting of my memories of what we all survived. What I lost was my first rented home (not destroyed, but rendered unlivable), the first place that was mine, my first real sensation of freedom. I lost a job that was the most perfect thing I could have imagined. I don't think I would have wanted to do any of that forever. It's certainly not what I want to do now. But oh, I wanted to do that work, to have that life, for just a little bit longer. 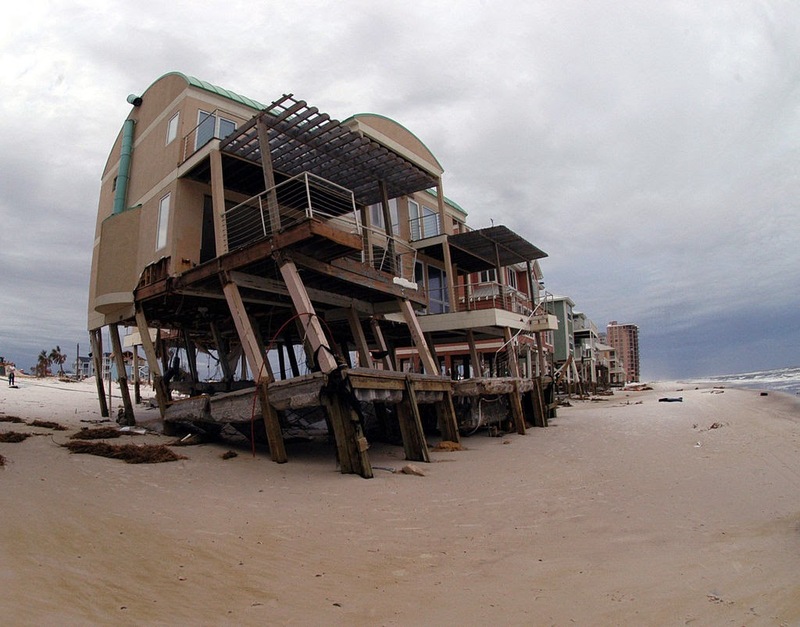 Beachfront condo crumbling, Perdido Key. Picture by me. But now I feel like I’m being too tragic, so I'll recount some of the good things. I discovered that MREs are surprisingly tasty, and are kind of like Christmas in a pouch because you never know what kind of snacks and desert you're going to get with your beef stew. I got to live with an amazing woman who opened her home to me for a few months after the storm, and whose sweet and optimistic nature is still an inspiration to me. I don't know if I can say I wish Ivan never happened to me. Because of the storm, I stayed in Florida for a much shorter time than I would have otherwise. Instead, I moved to Massachusetts and met one of my closest friends. And because I met her, a few years later, she gave me a professional reference that got me the job I have now. And of course I have all the amazing memories from the time I did get to spend there. All the time "rescuing" juvenile loons who couldn't walk on land, because tourists would call us over ("There's a duck with two broken legs! I threw sand at it, but it didn’t move!"). The time that the lifeguards found a dead sea turtle and brought it back to the pier where all the tourists were, and there was the one tourist who asked my coworker, "Is it dead?" and she replied, "Well, it doesn't have a head." (and then there was the time I had to respond to a dead turtle washing up on the beach on Thanksgiving… and let me tell you, few things smell worse than dead marine animal). I could go on. It was so much fun. I'm not sure how to end this. I don't have any big life lessons or such to share. I'm just glad to revisit my memories of the time there, even if 23-year-old-me's journaling was kind of painful, and if looking at the pictures was far more so. I still miss Pensacola and the South; you can see my massive affection for the area in the fact that I made Juliette from there. I can't wait to visit again, and go to Bagelheads and that Irish pub and those beautiful beaches, even if I don't think I'll ever risk living in hurricane territory again. First of all, you are so cool. I really enjoyed this post. That is possibly the sweetest comment ever. :) And thank you - it was tough to write, but cathartic too. How to Write Kissing Scenes that ROCK!